2016, the year of the customer. Customer data is a monster unleashed; newly self-aware customers are throwing retailers for a loop and technology is advancing rapidly. 2016 is challenging brands to get a foothold and truly deliver the relevant, real-time experiences that customers have come to expect. "When we started, we had five different databases and none of them spoke to one another. Once we had the 360 degree view we could really drive measured ROI by reaching customers with segmented tactics to drive conversion and satisfaction." - Colin Hall, Allen Edmonds. 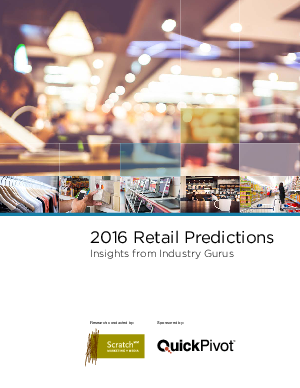 • What do retailers need to focus on with technology? • What is agile marketing in the retail world? • Who is doing these things the best? Complete the form to the right in order to download your copy of the report.